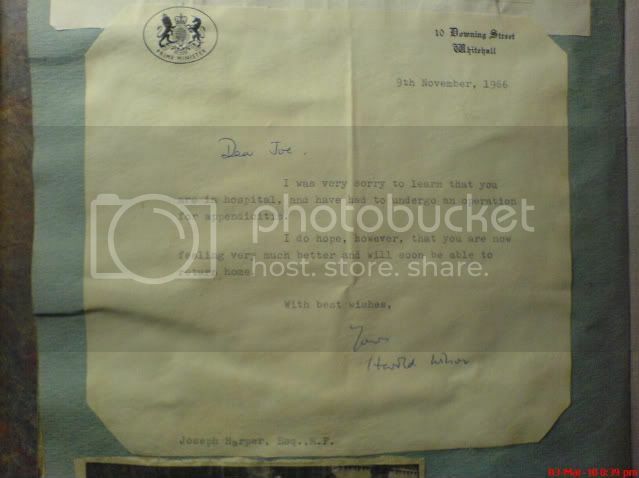 By good fortune or fate a number of documents covering Joe’s political history were recently saved from a garden incinerator. 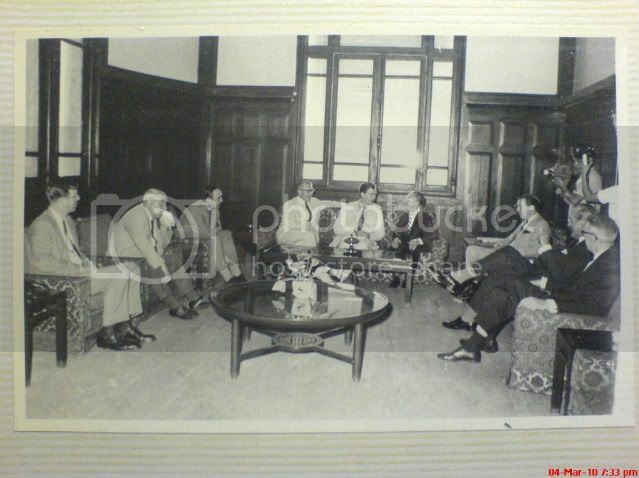 Below is a selection of documents and pictures saved. 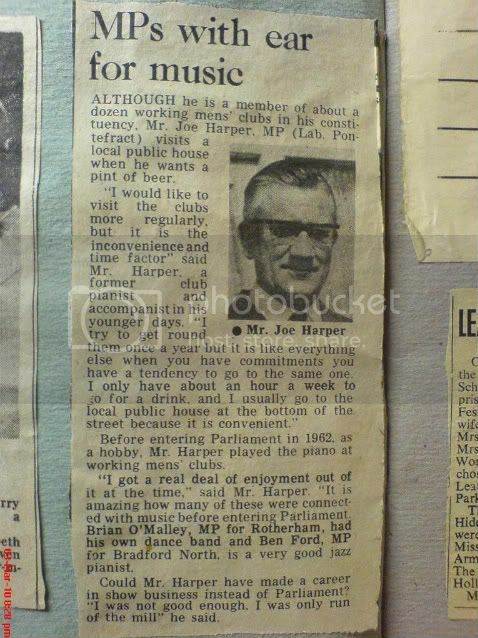 Good bloke was joe harper, i think one of his sons still lives in feath. 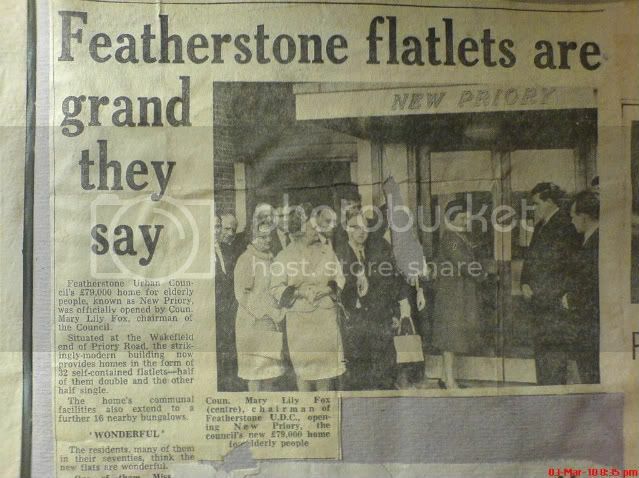 yes glyn joe's son and 2 grandsons still live in featherstone. after my gran, joe's wife passed away earlier on this year, lots of new information came to life that we never knew about grandad. suitcases hidden away got opened and were full of pictures, log books and scrap books and lots of other things. as you can imagine we were all taken a back by it all but anyone wanting to see any of it are quite welcome to. im trying to get things sorted out and coppying things onto disk but hard to find time. gareth has made a start and done a disk for us but more have to follow. 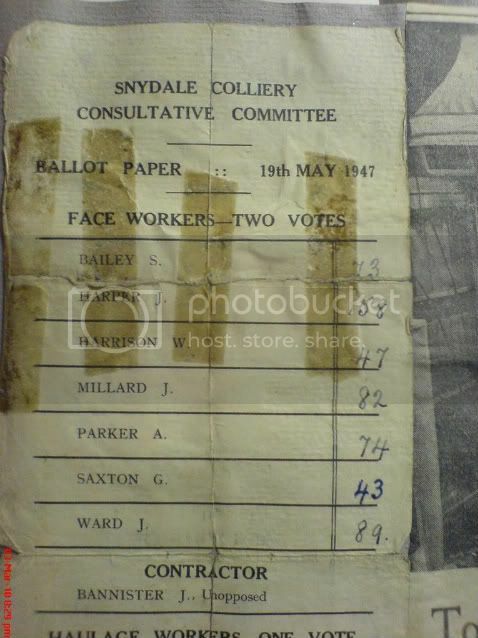 i still have a postcard joe sent to me from russia when he was the delegate from snydale colliery and i will treasure that card all my life. Joe harper got my wife a house when she came back to live in feath, she says she doesn't know what she would have done without his help, she is eternally greatfull to him. My God, where were these found. Looking at the dates they were posted it looks as though someone must have disposed of them shortly after my Gran (Gwen) passed away last year. Thanks for putting these on. My Grandad (Joe) passed away in 1978 when was aged 10. I still have memories of his musical talents when we use to sit round the organ or piano. He could also be a strict disciplinarian. 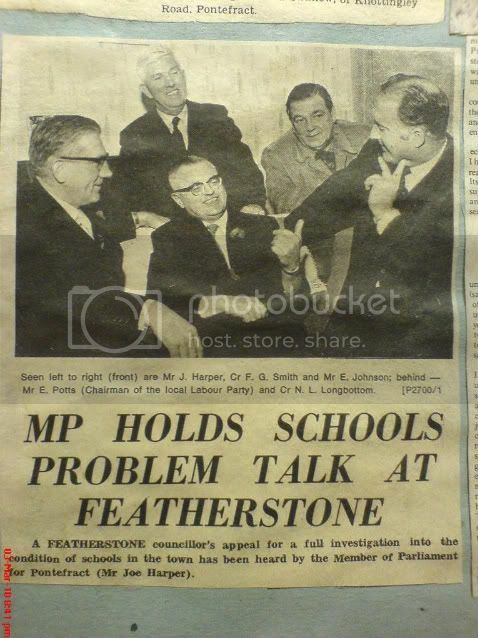 I have an old article somewhere, which my Gran gave me with information about his involvement in the community. He was a member of 11 commitees, and I recall my Gran telling me of all the people that use to come to the house in Bedford Close for various political reasons. 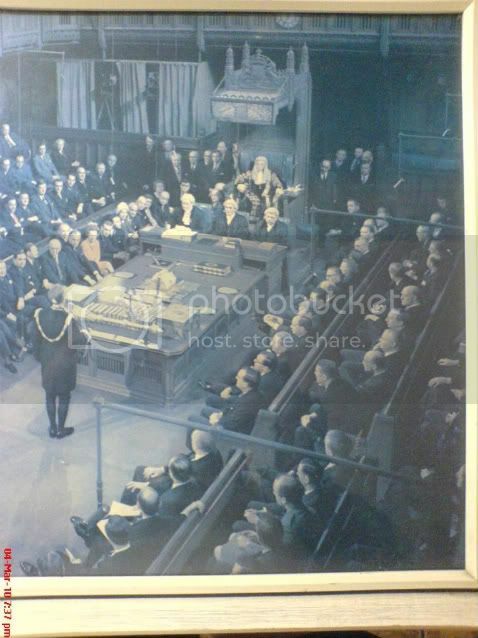 He spent his working week at parliment in London then on a weekend would either drive or travel home by train, before returning to work on the Sunday. As an active political figure in the 70's it was difficult to find any reprieve from his working life. Even when visiting our house on Dixon Street, he would often be badgered by neighbours. 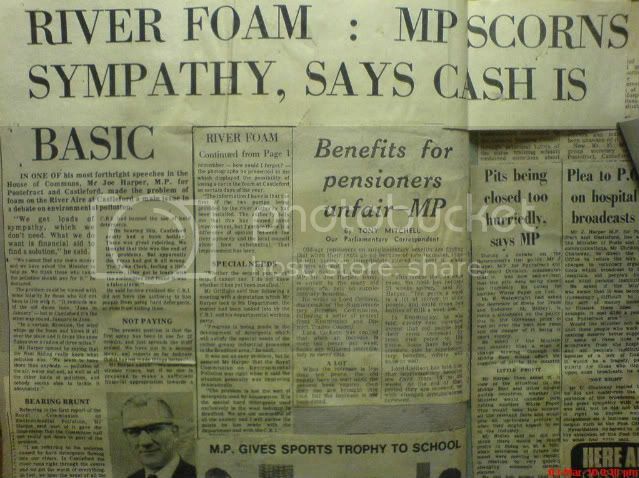 I guess this was and still is the nature of being an MP. Surely all this pressure was a contributor to his early death at the age of 64. 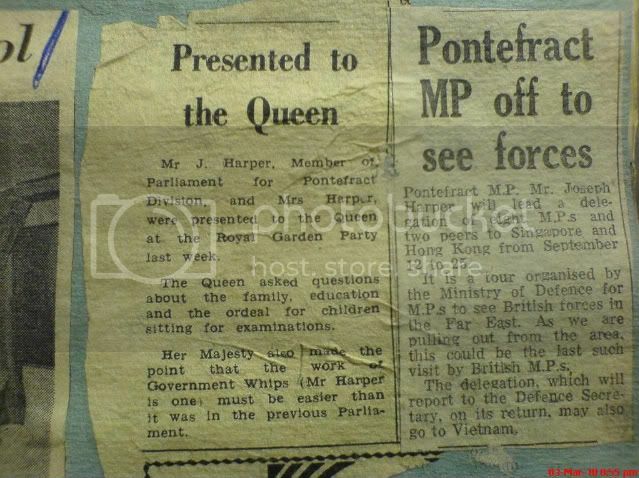 Thankyou for reading, Mark Harper (joe's Grandson, son of Glyn). Hope I am in order with a reply as this is your family thing however important to Featherstone. The pictures shown and many more documents were saved from a fire by one of your relations who is a member of this forum. The documents were recorded and produced in full on to a disc that was given back with the documents. Happy to pass on a copy if ok with family details as you can understand. Thank you for a further insight that many will never have heard or understood. Personally seem to not get on with most of the Labour party but there are a few exceptions especially from those that did the political job just as it should have been done. To follow Joes ways you will not go far wrong. Your Grandad was one of a kind and very few and far between. You should be proud and use his life as inspiration. I and others I am sure have appreciated your comments and insight. Any further history would be very welcome. I could read his exploits all day.